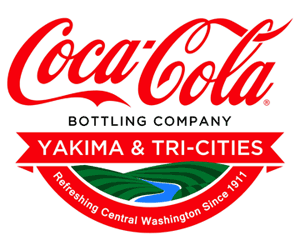 We are the Coca-Cola Bottling Company of Yakima & Tri-Cities. Owned by the Dolsen family since 1974, we’re a 3rd generation family-owned bottler serving Benton, Franklin, Kittitas and Yakima Counties. We operate warehouse facilities in Yakima and Pasco with corporate offices in Yakima. We work with a little bit of attitude. We’re proud of who we are and the communities we serve. The attitude is to help make each of our communities a better place to live. We do that by building relationships. Customers’ needs come first with us – and we meet them face to face. The Coca-Cola Bottling Company of Yakima & Tri-Cities has grown steadily over the years. Modernized facilities, equipment and systems help us provide the best in customer service. What started as a small company with 40 employees is now a total beverage company with over 175 people. From a handful of soft drink choices, we now offer more than 400 beverage options including fruit juices, juice drinks, waters, sports drinks, teas, coffees and even milk. Relationship building starts with our employees. We take pride in watching them grow in their careers. We share in their lives as they raise families, coach little league and attend graduations. We encourage their good health with at-work gyms and trainers at both the Yakima and Pasco facilities. We survive because our communities support us. We need to support our communities in return. And we do. We treat our customers like friends and our communities like home….because they are. Our company is made up of over 160 men and women. We are proud that many of our people have chosen to spend their entire career with us. We have positions in Sales & Merchandising, Service, Delivery, Administration, Vending & Warehousing. If you are interested in joining our team, check out our job openings on the Careers page.